Design, build and install a lab and jellyfish holding rack to show the various stages of a jellyfish's life cycle. Cube Oceanarium is a record breaking public aquarium located in Chengdu, China. Opened in February 2015, the aquarium displays over 33,000 different marine life specimens including over 400 species. The centrepiece of the aquarium is a huge 8,500,000 litre display aquarium with a 40 meter long acrylic viewing window. This tank currently holds two Guinness World Records. In 2016, RedFin were contracted to add to an educational display showcasing the various points in the jellyfish life cycle. 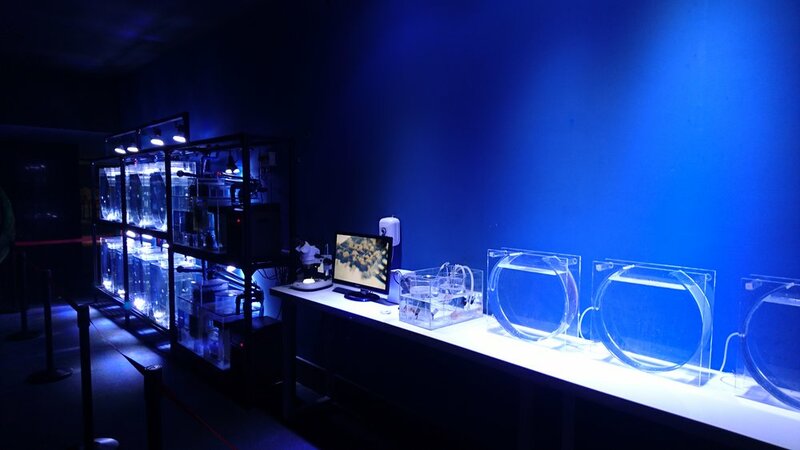 The laboratory display unit comprised of 15 jellyfish aquariums custom designed to hold jellyfish at different maturities. A lab bench and electronic microscope with monitor was installed to provide visitors with an up-close look at microscopic jellyfish polyps. The RedFin installation team successfully completed the project in November 2016, after which it was opened to the public.